Author name not noted above: Martin Luther and William Roper. Translator names not noted above: N.H. Thompson, Ralph Robinson, R.S. Grignon, and C.A. Buchheim. Originally published between 1909 and 1917 under the name "Harvard Classics," this stupendous 51-volume set-a collection of the greatest writings from literature, philosophy, history, and mythology-was assembled by American academic CHARLES WILLIAM ELIOT (1834-1926), Harvard University's longest-serving president. Also known as "Dr. Eliot's Five Foot Shelf," it represented Eliot's belief that a basic liberal education could be gleaned by reading from an anthology of works that could fit on five feet of bookshelf. 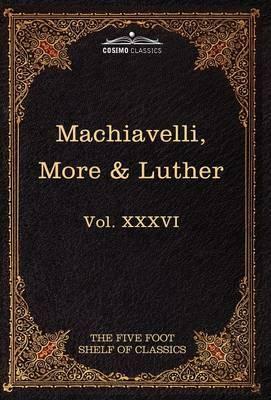 Volume XXXVI features essential works from 16th-century Europe: - The Prince, the infamous 1513 collection of thoughts on politics and ethics by Italian diplomat and philosopher NICCOLÒ MACHIAVELLI (1469-1527) - Utopia, by English scholar SIR THOMAS MORE (1478-1535), a 1516 dissertation on the pressing social issues of his day - The Life of Sir Thomas More, dating from the 1550s, by his son-in-law, English writer WILLIAM ROPER (c. 1498-1578) - The Ninety-Five Theses, the 1517 criticism of the Church that started the Protestant Revolution by German theologian MARTIN LUTHER (1483-1546), plus his "Address to the Christian Nobility" and "Concerning Christian Liberty" English statesman and writer SIR THOMAS MORE (1478-1535) is best remembered as both a humanist scholar and a religious martyr: he was beheaded by King Henry VIII for refusing to acknowledge the monarch as the head of the Church of England.